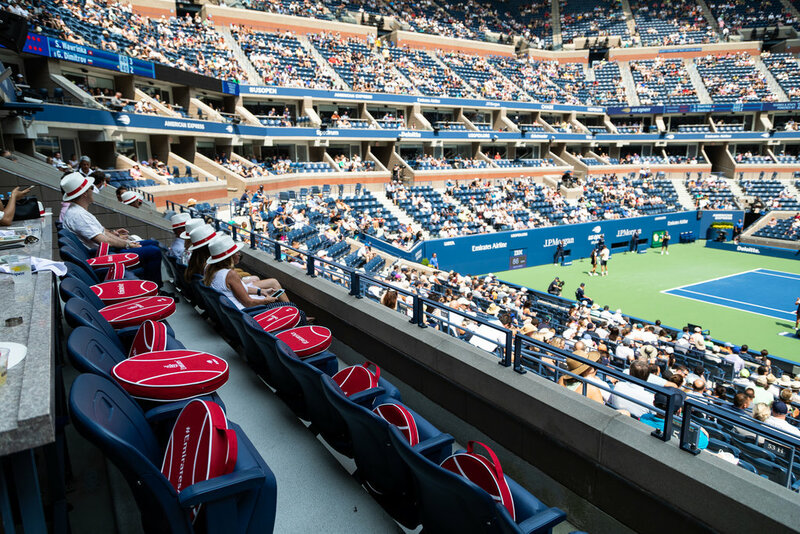 Luxury suites inside Arthur Ashe Stadium on the grounds of the USTA Billie Jean King National Tennis Center in Flushing, New York, are sold on a session-by-session basis and can cost anywhere from $15,000 to $120,000. Located at center court, the Emirates suite provides one of the most coveted views. Upon entrance, guests are welcomed by a pair of Cabin Crew members as if they were boarding an Emirates flight. While entrants aren’t departing JFK or LaGuardia airports for Dubai, they are taken on a journey similar to that of an Emirates passenger. Entrants to the invite-only hospitality suite are offered cold towels and panama hats to combat the sun’s rays while watching some of tennis’s top players take the main court of the annual two-week Grand Slam event. From there, the suite offers a comforting and luxurious space overlooking center court. 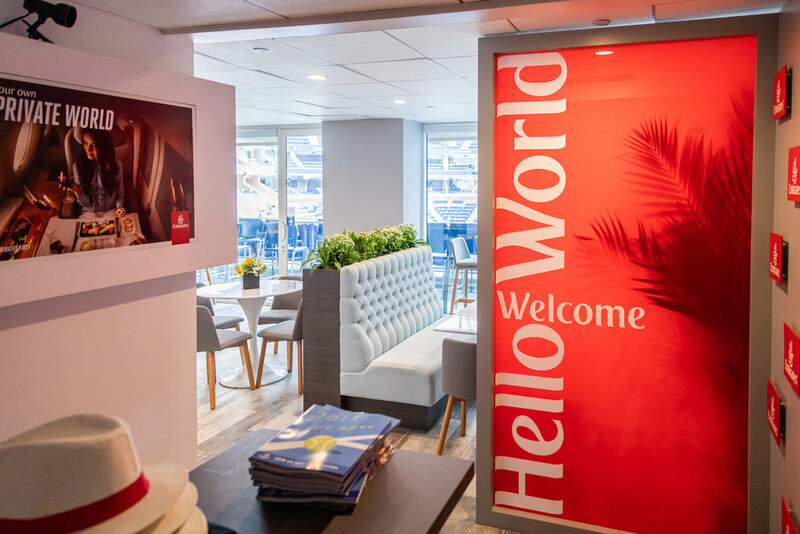 The Emirates suite, which holds up to 80 people, underwent a redesign and renovation in 2015 which helped open up the space. Premium food and beverage are on offer to guests with a gourmet buffet including tuna tartare, seared salmon and an assortment of fresh salads. The Emirates suite is also the only space to have a private sushi chef throughout the entire US Open. Tasty treats including red velvet cake, peach cobbler and macarons are offered for dessert. In celebration of its continued relationship with Moët Hennessy, Emirates also features private champagne tastings paired with canapes. Guests can remain inside the air-conditioned suite to watch the action while avoiding the heat or enjoy the match in the open air on plush seats with prime central views. No need to strain your neck turning your head side to side during volleys from this vantage point. Not only are guests treated to high-end hospitality and VIP views, they can also enjoy celebrity sightings, including Joe Jonas, Priyanka Chopra, Aziz Ansari, Sophie Turner, Pierce Brosnan and more. Watching the US Open from the Emirates suite is a one-of-a-kind experience. Some lucky fans at the 2018 tournament even had their seats upgraded so they could live the suite life. Though not as popular as soccer or basketball, dodgeball participation is on the rise in Hong Kong, especially at the youth level. Members of the Hong Kong Dodgeball Association talk about the sport’s appeal. Former US Olympic sprinter John Carlos discusses how his protest during the 1968 Olympics laid the groundwork for current demonstrations, including Colin Kaepernick's fight for social justice.